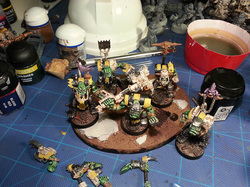 So I decided to start working on my orks again. 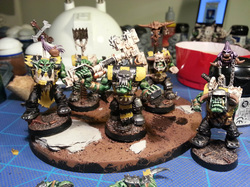 I've fallen in love with the bad moons scheme of late, so I decided to paint a group of nobz in yellow and black to add some flavor to my army. 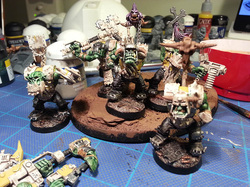 I started out with a white primer on the nobz, then drenched them in devlan mud (agrax earthshade), and letting them dry. The devlan mud over the white primer helps pull out details, and gives you a nice default shading to build upon. I settled on some desert wasteland bases from dragon forge design, as I've been using them on other members of my ork army. 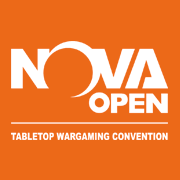 Jeff is the main guy over at dragon forge (one man shop), and he does excellent work! After the wash was dried (let it sit for a good 30-45 minutes), I started with my other layers. Thrakka green (Beil-Tan) is my main skin tone, applied in a multiple coat process. 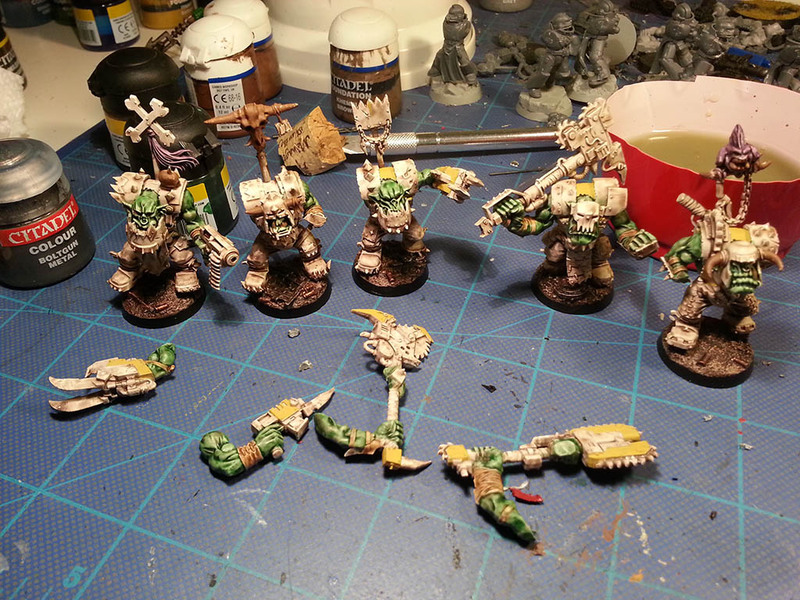 I like to use 1-2 coats on the boyz, and 3-4 coats on the nobs for a deeper green. The nice thing about the washes is that you don't need percision to paint well. The wash does all the work...and any messiness on the model works great for orks, because they don't exactly care for sharp clean lines :). The bases are also done in this shot. I'll do a little guide on how I do their bases in the future. Yellow and black finally make an appearance! I used badab black (nuln oil) + chaos black (abbadon) for the blacks. 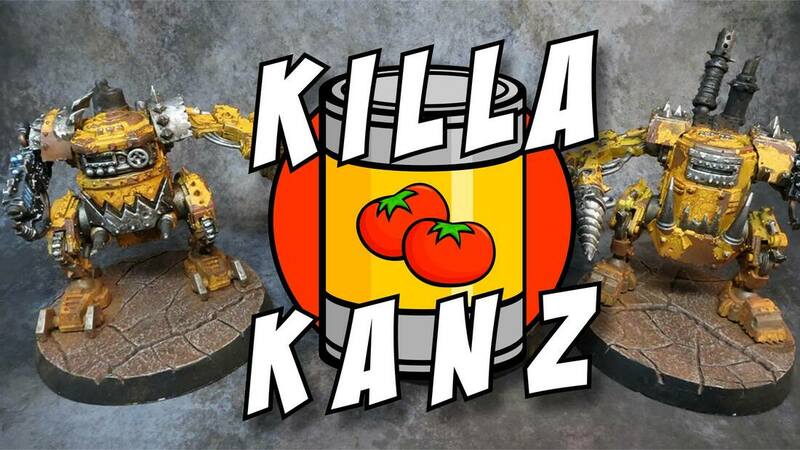 For the yellows I used ivanden (averland) + skull white highlights (white scar) +casandra yellow shade + lamenters yellow. It's a multi-part process that sounds worse then it is. Because these all have wash consistencies, they easily flow in cracks and crevices, and take a lot of the hard work out of the equation. Ivanden darksun was really the hardest to apply, as it is more of a true base, and doesn't take to watering down very much. Getting close to the end. 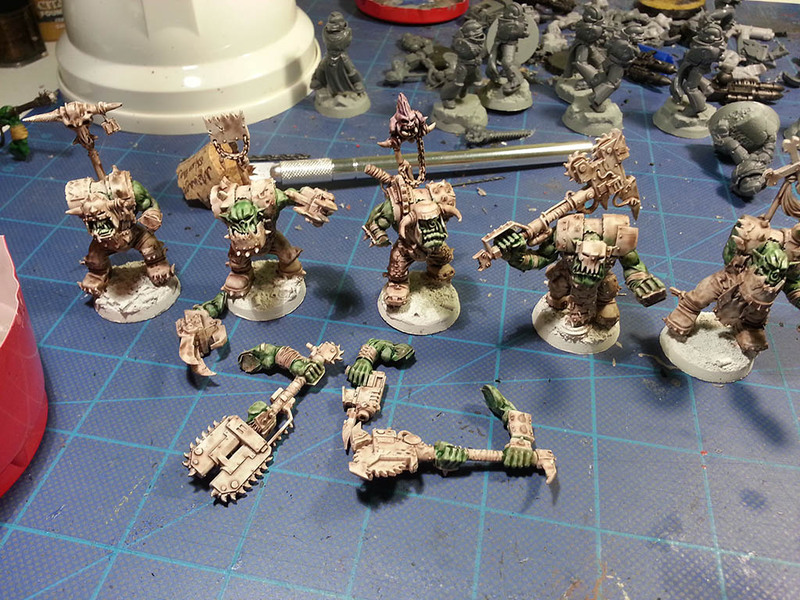 Boltgun metal (lead belcher) on the metal parts, and bleached bone (ushabti) for the bone work.. The eyes get a bit of merchite red (mephiston), followed by some blood red highlight (red sunz). Continued progress. 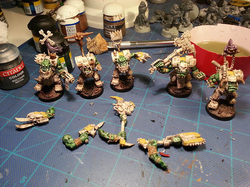 On the larger two handed weapons, I used tape so I could paint them, and later glue in place. 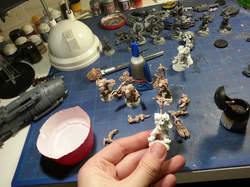 I always try to separate the larger weapons from the model when painting, either by magnetizing or taping the ends. Makes painting SO much easier! There is a few missed steps after this photo. After the model is finished with most of the paint, I do light coats of devlan mud (agrax earthshade) to pull the model together. 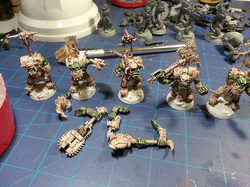 That combined with light dry brushing of boltgun (leadbelcher) helps to chip up and dirty the models. It also helps hide most wash lines, and really pulls the model together on the table. And finally a nice camera! You'll see the little guides of my work slowly improve over time, as I recently got a D5300 Nikon for xmas. It takes some fantastic shots! These models are both being used for my kill team, and for beefing up my boyz squad. I hope you enjoyed this little walkthrough of my nobz painting. More to come!